Tips, tricks and mobile apps… oh my! There’s a plethora of mobile apps available these days that can be of great benefit in your genealogy research. 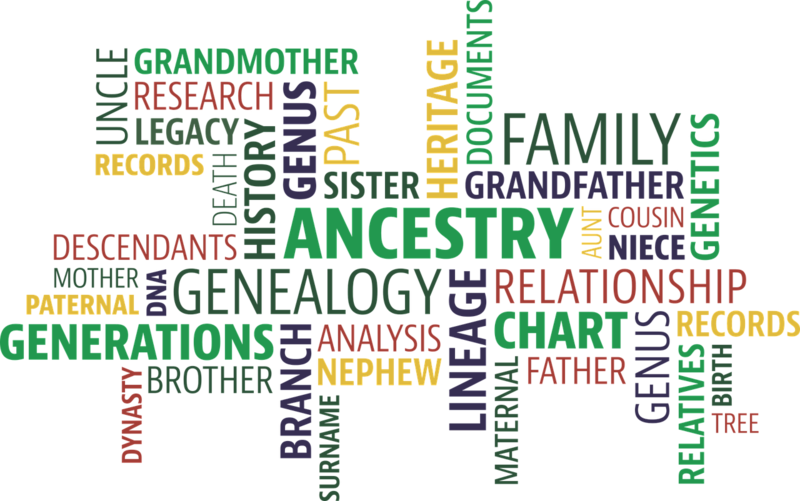 Here are just a few suggestions recommended by professional genealogists. This list is by no means exhaustive. Have fun picking and choosing which apps will work best for you! The Notes app on your iPhone, iPad and iPod touch allows you to quickly write a thought manually or ask Siri to start a note. You can also create a checklist, format a note, add attachments, add a photo or video, pin a note and scan and sign documents. You can use iCloud to update your notes on all of your devices. Access Apple Support here for tips and instructions on using the different features of Notes. Google Keep Notes is compatible with iPhone and Android. It is pre-installed on most Android devices with the Google services enabled. You can take quick notes, make lists, standard checklists, pin notes, color code notes, use voice notes, share notes, set reminders and it syncs with your Google account, thus syncing across devices. 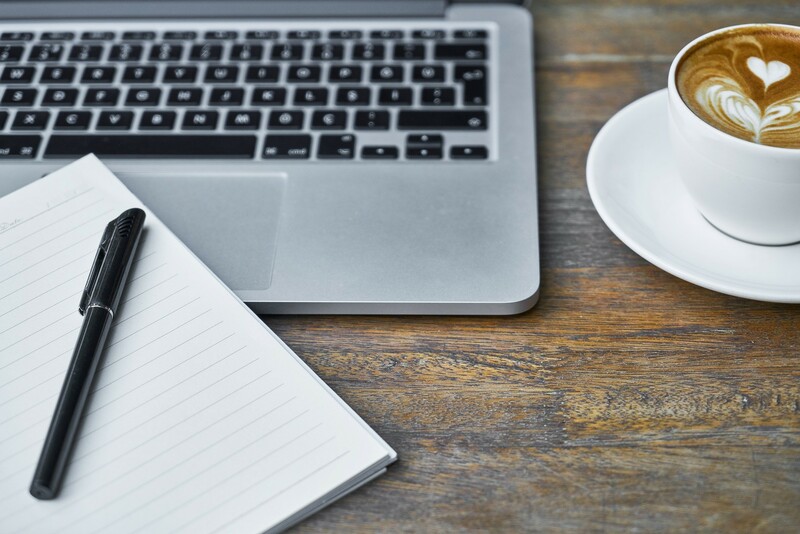 Evernote can handle all types of notes including typed text, audio, photos, videos, content from websites and a lot more. 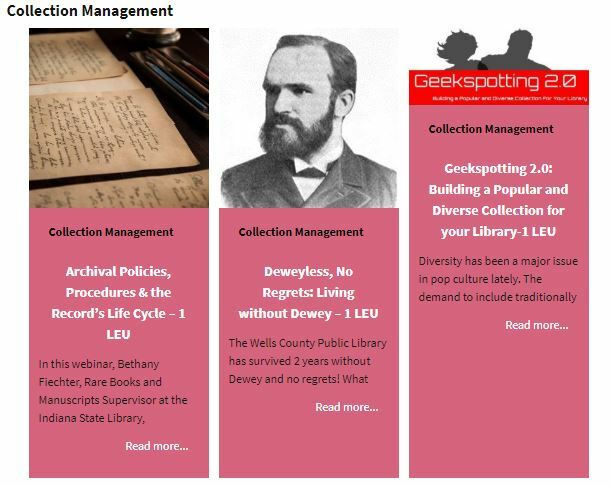 Imagine finding a great article or document about an ancestor on the internet; it can easily be saved with Evernote. You can save parts and even full pages from the internet. Evernote is free if using it on one or two devices. If you need to use Evernote on more than two devices, or upload more than 60 MB a month, there is a paid plan available. Trello is a free project management app that makes it easy to organize, write, collaborate and deal with task management. It uses customizable boards, lists and cards to help with organization and visualization of everything on which you’re working. You can upload photos, videos and files to share. Trello lets you add power-ups like apps of calendars, Evernote, DropBox and so much more. A Drop Box Basic account is free and includes 2 GB of space. You can also earn more space on your Dropbox Basic account. Using Dropbox is like using any folder on your hard drive but the files you put into Dropbox will automatically sync online and to any other devices linked to your account. DropBox can be used as a backup for your documents, photos, etc. For those not familiar with these apps, Family Tree Magazine recently covered the basics regarding the use of the apps. The article can be read here. Google Photos allows for basic photo editing. Google Photos uses facial recognition as opposed to tags. Photos are organized by date so they are easily found by using the timeline. You can create photo books and albums, which are shareable. You have unlimited cloud storage of photos less than 16 megapixels and video shot at 1080p or lower. 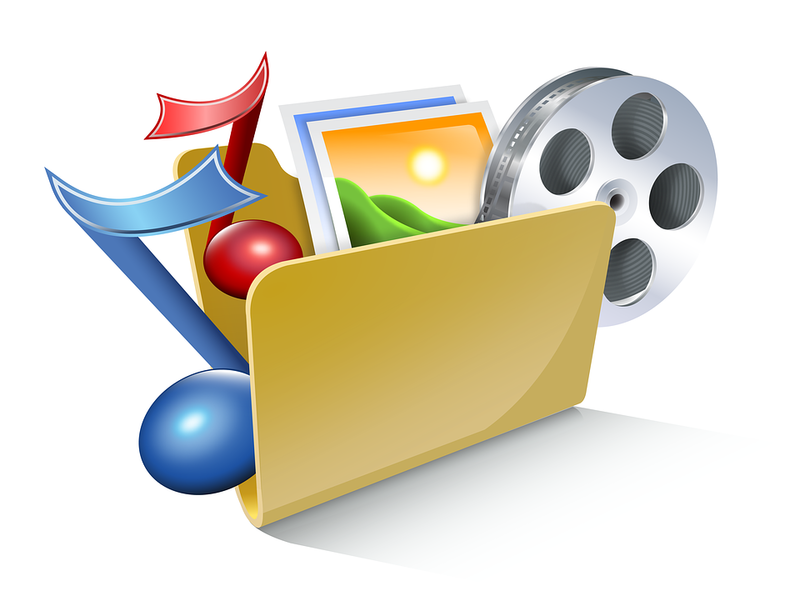 If you need to store larger images or higher resolution video, you can do this for a fee. Google Photos is also a great app to use for backing up your photos. CamScanner is a mobile scanner that makes it easy to scan, archive and share anytime and anywhere. This app has the ability to auto enhance images and to perform auto edge cropping. It also features optical character recognition (OCR) and supports syncing between your devices. Adobe Photoshop Fix is extremely helpful to use with those old family photos that might need some restoration. The spot heal tool will correct small blemishes and a clone stamp tool will fix larger or more serious image problems. There is also a smooth tool to use when there is graininess in a photo. A variety of editing tools can be found in the adjust tool. Storypix allows you to create a video with audio narration from one or several photos. You can also add scenes, use the zoom function and add text captions to enhance your story. Your new video is also shareable. Adobe Spark is a free graphic design app that allows you to create web pages, video stories and exciting graphics. With graphics you can add text and apply design filters to your photo. With web pages you can assemble words and images into beautiful web stories. Video stories allows you to easily add photos, video clips, icons and your own voice. Find A Grave is the world’s largest grave site collection. “Find the graves of ancestors, create virtual memorials or add photos, virtual flowers and a note to a loved one’s memorial.” This app allows you to search or browse cemeteries and grave records looking for ancestors. Google Translate is great for family history. You use your phone’s camera to hover over text in a foreign language or you can take a picture of the text. Google Translate will translate and write out the text for you in your language of choice. It can translate between more than 100 languages. You can also translate entire websites. Google Earth lets you explore the world from above with satellite imagery, showing 3-D buildings in hundreds of cities and 3-D terrain of the whole earth. Take a look at the towns where your ancestors originated. Feel free to share any other mobile genealogy apps that you find helpful. 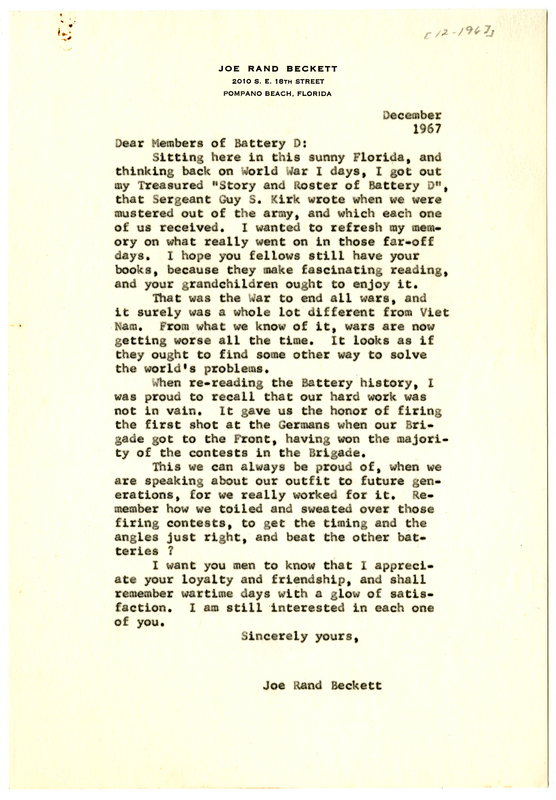 This blog post was written by Alice Winslow, librarian, Genealogy Division of the Indiana State Library. In 2013, the federal government issued minimum standards of documentation required for individuals to obtain a state-issued ID or driver’s license. 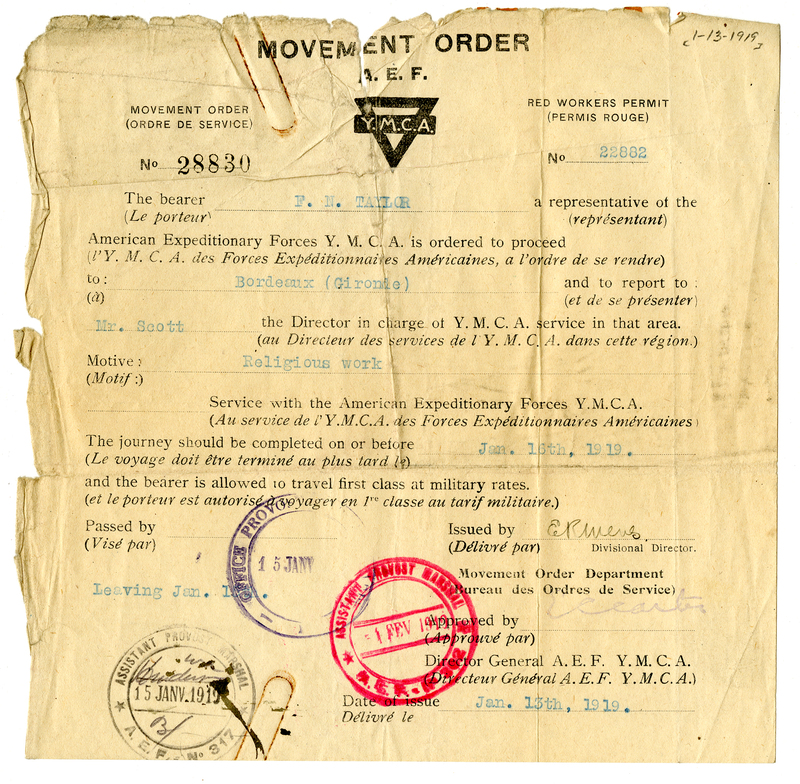 These standards were known as Real ID. The standards have been phased in over time, but beginning in October 2020, Real ID-compliant identification will be required for certain activities, such as boarding an airplane or entering a federal building. 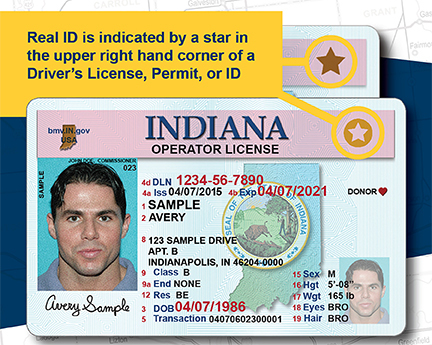 For more information on Real ID, check out these articles from the Department of Homeland Security and the Indiana Bureau of Motor Vehicles. Included in the list of required documents to obtain a Real ID is documentation of legal name changes. This includes name change due to marriage. So, if you changed your name when you got married, you will need to provide a certified copy of your marriage license when renewing your ID. This includes all marriages, even if you are now divorced. Photo courtesy of the Indiana Bureau of Motor Vehicles. If you do not have a certified copy of your marriage license, you can obtain one from the Clerk of Court’s office in the county where you obtained your marriage license. In Indiana, only the county clerk’s offices are able to provide certified copies. If you do not remember where you obtained your marriage license or if you have contacted the county and they cannot find the record, you can search for your post-1958 Indiana marriage license in several places, depending on the year of marriage. The Indiana State Library’s Indiana Legacy database includes the “Indiana Marriages, 1958-2017” index. 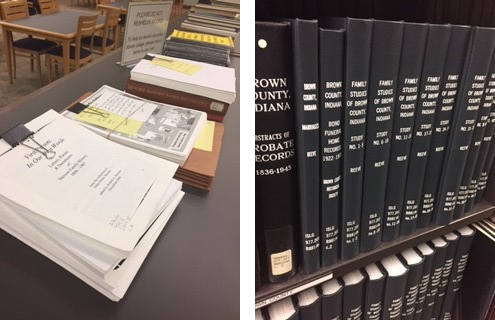 As the title suggests, this index contains all marriage licenses issued in Indiana between 1958 and 2017, including the names of both parties, the marriage date, and the county that issued the license. This database does contain some known OCR issues, so if you find an error in a record, please let us know so we can correct it. For marriages that took place between 1993 and the present, you can also check the Indiana Supreme Court Division of State Court Administration’s Marriage License Public Lookup. This database is updated regularly and includes marriages as recent as two weeks ago. If you have an Ancestry.com account or if your local public library has Ancestry Library Edition, you can also search the Indiana Marriages, 1917-2005 database, which contains full scans of Indiana marriage records from the Indiana State Archives. Be aware that this database’s title is somewhat misleading, as the scans actually cover 1961-2005. Unfortunately, there is not a statewide index to Indiana marriages pre-1958. The most complete sources are on FamilySearch, the Indiana Marriages, 1780-1992 and Indiana Marriages, 1811-2007 databases. These databases are free for you to use at home, but you will need to create an account. If you are having trouble locating your marriage license through these resources, please contact the Indiana State Library Genealogy Division at 317-232-3689 or Ask-A-Librarian. This blog post is by Jamie Dunn, Genealogy Division supervisor. Today we welcome guest blogger Andrew Rhoda of the Lilly Library at Indiana University. Rhoda is the world’s only puzzle curator. 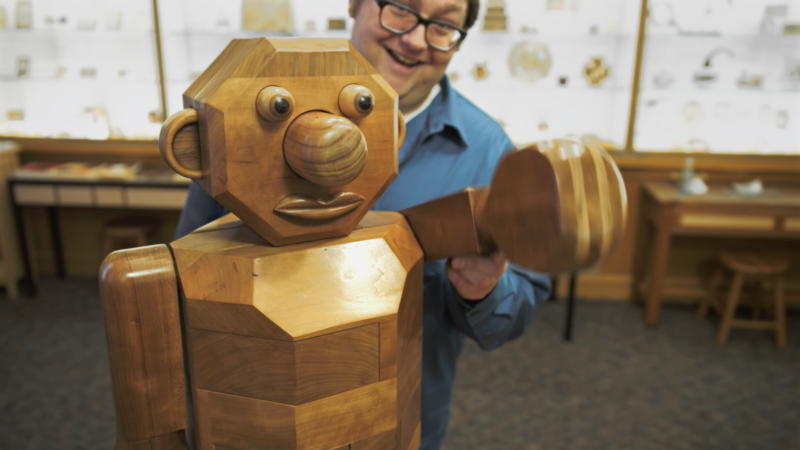 The Jerry Slocum Mechanical Puzzle Collection at the Lilly Library is a collection of puzzles designed by the world’s most innovative designers of fascinating and confounding objects. The library’s collection of mechanical puzzles is the only one in the world available to the public. Mechanical puzzles are different from crosswords or jigsaw puzzles, which are what most people think of when they think about puzzles. In the book “Puzzles Old and New,” Jerry Slocum and his co-author Jack Botermans define a mechanical puzzle as, “…a self-contained object, composed of one or more parts, which involves a problem for one person to solve by manipulation using logic, reasoning, insight, luck and/or dexterity.” Some examples of well-known mechanical puzzles are the Rubik’s Cube, the tangram and the 15-puzzle. The Lilly Library at Indiana University, Bloomington. 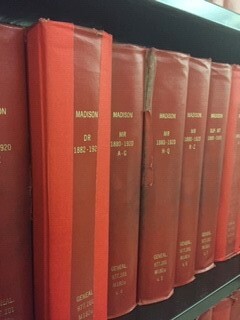 Courtesy of Indiana University Libraries. Mechanical puzzles have a long history. The oldest known mechanical puzzles were not even intended as entertainment. Romano-Celtic puzzle padlocks dating to the second century B.C.E. were small, ring-sized locks used as security measures. In the 19th century, the popularity of mechanical puzzles as entertainment increased. The first catalog of puzzles appeared in 1893, written by Professor Hoffmann. This book featured puzzles of all kinds; however, it is most notable for its descriptions of what we know as mechanical puzzles. These puzzles are known as Hoffmann Puzzles, as this work is the first historical reference for these puzzles. In recent years, technology has changed how mechanical puzzles are made. 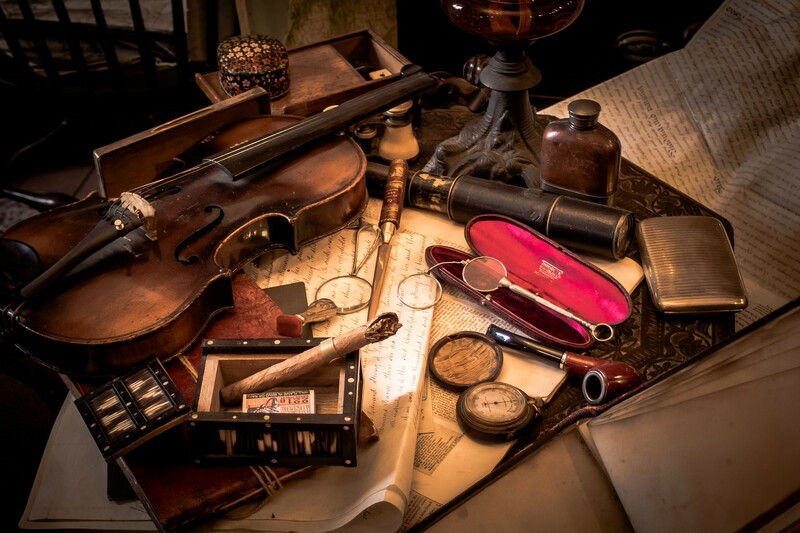 Throughout the 19th century and early 20th century, puzzles were usually made of wood or metal. 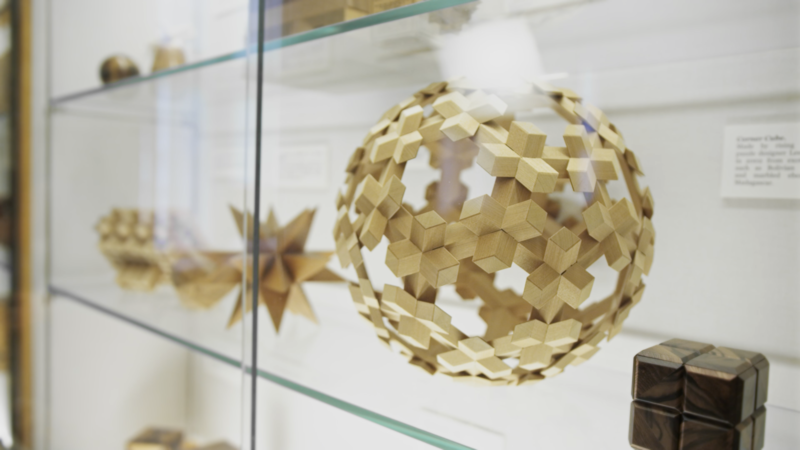 However, in the later 20th century and 21st century, new technologies have emerged, like three-dimensional printing, that are changing how puzzles are made. 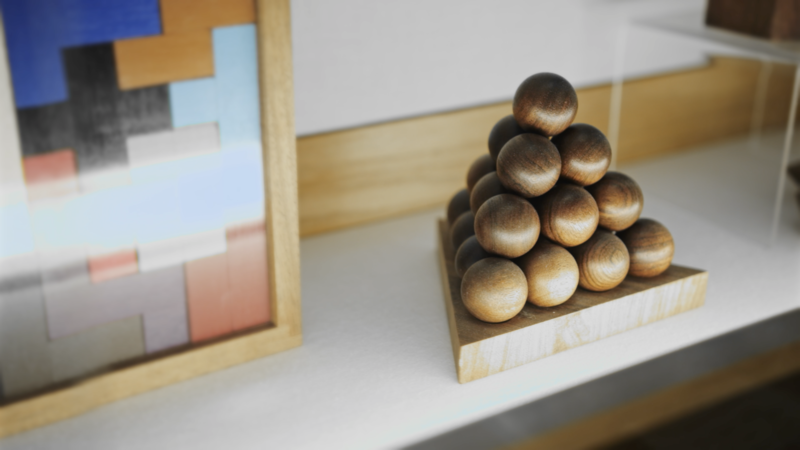 Modern puzzles designers now create these ingenious objects using classic techniques and modern technology to challenge puzzle solvers. While most interlocking puzzles are small enough to be held in the hands, some interlocking puzzles can be quite large. For example, this “Wooden Robot Puzzle” is around three feet tall. Courtesy of Indiana University Libraries. Slocum was born near Chicago, and in 1939, he began collecting puzzles at the age of eight when his parents brought back a puzzle from the New York World’s Fair. That puzzle was the Trylon-Perisphiere, which was a small plastic interlocking puzzle. From that point, Slocum began collecting mechanical puzzles of various kinds. He began researching mechanical puzzles, and when he could not find puzzles to purchase, he learned how to make his own copies of those puzzles. Sequential movement puzzles feature a solution that requires a sequence of moves to solve the puzzle. The Boss Puzzle, a version of the 15-puzzle, has a certain set of moves that puts the numbered blocks in order. Courtesy of Indiana University Libraries. In 1993, Slocum established the Slocum Puzzle Foundation to promote the use of mechanical puzzles both for entertainment and for fostering creative thinking and problem solving. He has also worked with various institutions across the country to exhibit puzzles from his collection. Interlocking puzzles come in many different shapes. They can be simple to very complex, like this puzzle “Polyhedron 32” by Yashirou Kuwayama. Courtesy of Indiana University Libraries. Through his research, Slocum developed a system of categorization for mechanical puzzles. The system includes ten categories, defined by what needs to be done to the puzzle to solve it. For instance, the first category is “put-together” as the solution is achieved by putting the pieces of the puzzle together. Modern puzzle designers have further developed the categories, both by developing specializations in those categories, and by combining qualities of two or more of them. To match these developments Slocum added sub-categories in his system. Put-together puzzles – To solve, you assemble the pieces in a predetermined arrangement. Take-apart puzzles – To solve, you disassemble the puzzle or open a compartment. Interlocking solid puzzles – To solve, you disassemble and reassemble the object. Disentanglement puzzles – To solve, you remove one piece such as a ring or string from the puzzle and put it back. Sequential movement puzzles – To solve, you repeat a certain sequence of moves a number of times. Dexterity puzzles – To solve, you use either gravity or some other type of motion. Puzzle vessels – To solve, you either take liquid from or pour liquid into the vessel without spilling. Vanish puzzles – To solve, you explain how parts of the puzzle disappear when the pieces are rearranged. Folding puzzles – To solve, you to fold the puzzle in such a way as to reveal an image. 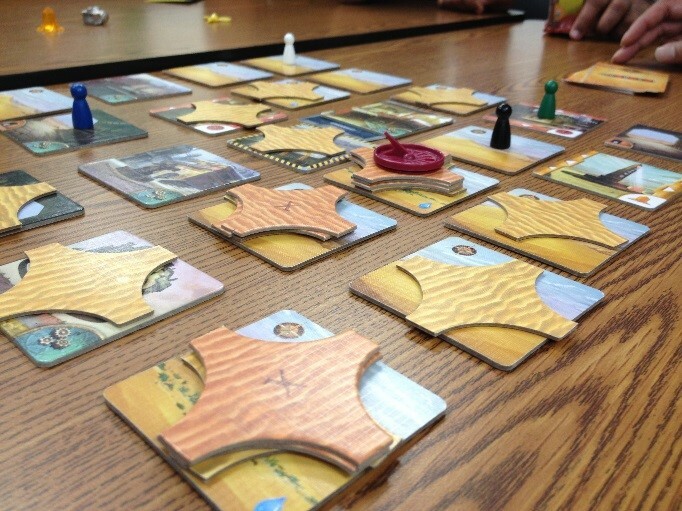 Impossible puzzles – To solve, you must explain how the puzzle was made. Put together puzzles can be two-dimensional or three-dimensional, such as Piet Hein’s “Pyramystery” shown here. Courtesy of Indiana University Libraries. To solve some puzzles in these categories, like the vanishing puzzle or impossible puzzles, the moving of pieces is not the point, but rather the description of how the puzzle works or was made. 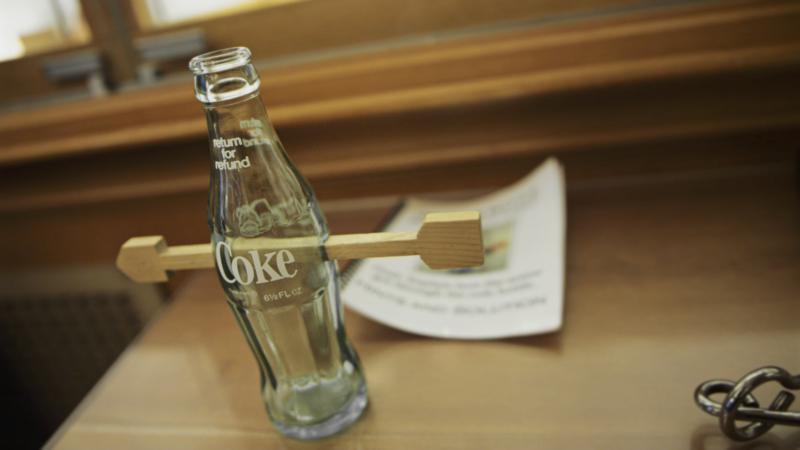 Impossible puzzles do not require any disassembly; you only have to answer a simple question: How did the arrow get through the bottle? Courtesy of Indiana University Libraries. When Slocum began thinking of where he would donate his collection, he selected the Lilly Library because, unlike a museum, donating his collection to a rare books library would mean that his whole collection would be available for patrons to solve. 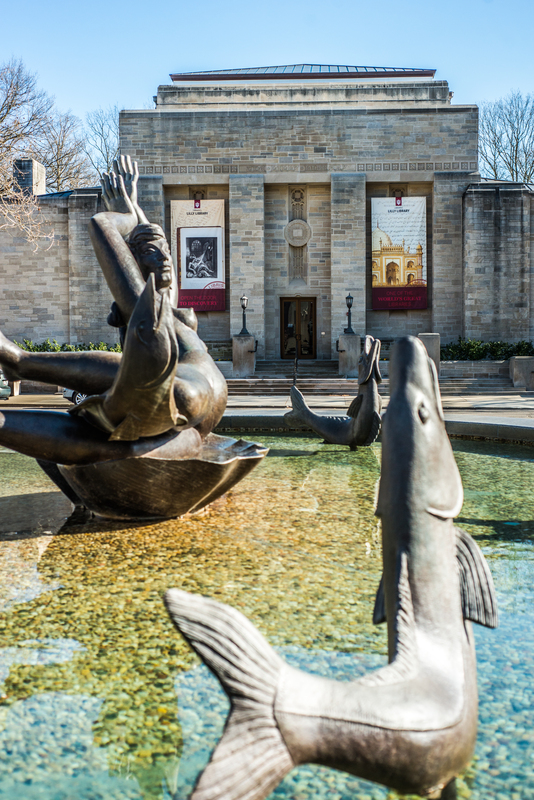 While traditional museum might only display a few puzzles at a time through exhibits, the Lilly Library provides access to the whole collection for patrons who visit the Reading Room. In 2006, Slocum began donating his collection to the Lilly Library. Since that time, he has been donating portions of his collection every year. Currently, the Slocum Mechanical Puzzle Collection consists of over 30,000 of puzzles, in addition to books and manuscripts relating to mechanical puzzles. These materials are accessible in the Lilly Library’s Reading Room and – barring a puzzle being in conservation – the contents of the puzzle collection are available for use. When requesting puzzles to consult in the Reading Room, it is best to allow three to four days processing time so that all items can be gathered for the visit. The puzzle collection is searchable through the Jerry Slocum Mechanical Puzzle Collection database. 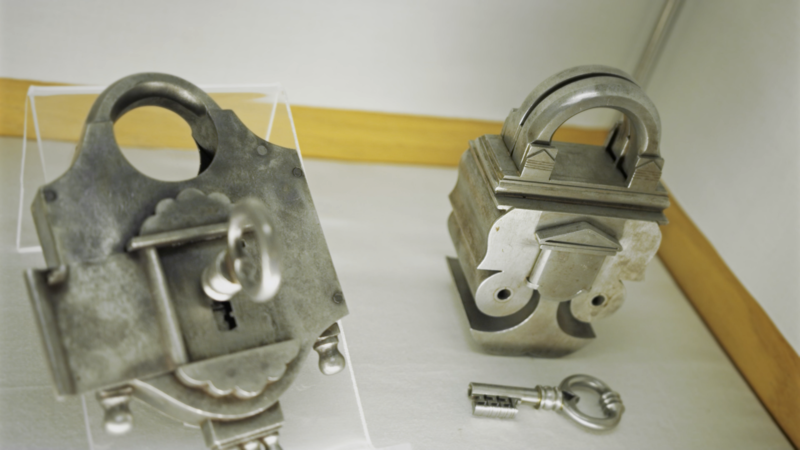 Puzzle locks, such as these Viennese Master Craft Locks from the 19th century, are the oldest category of mechanical puzzles known. Puzzle locks are a sub-category of take apart puzzles. Courtesy of Indiana University Libraries. 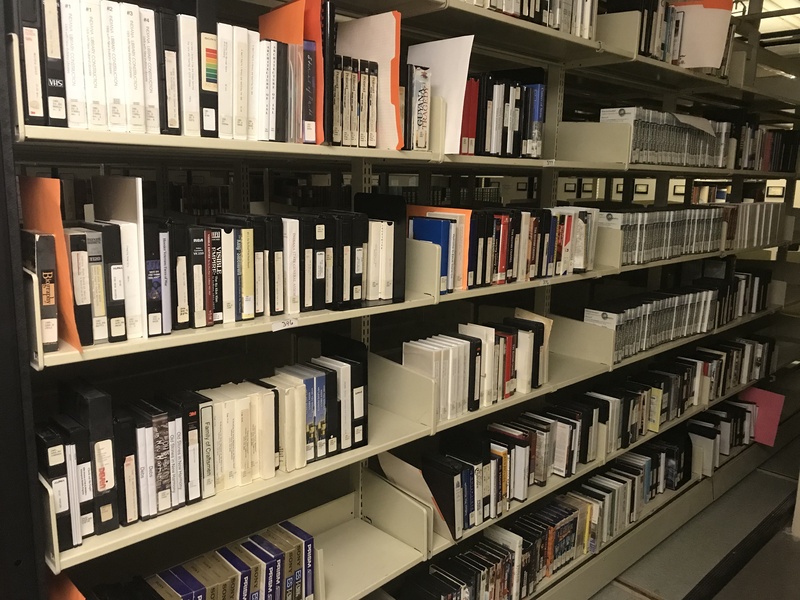 A permanent exhibit of highlights from the collection is on display in the Lilly Library Slocum Room located at 1200 East Seventh Street in Bloomington. 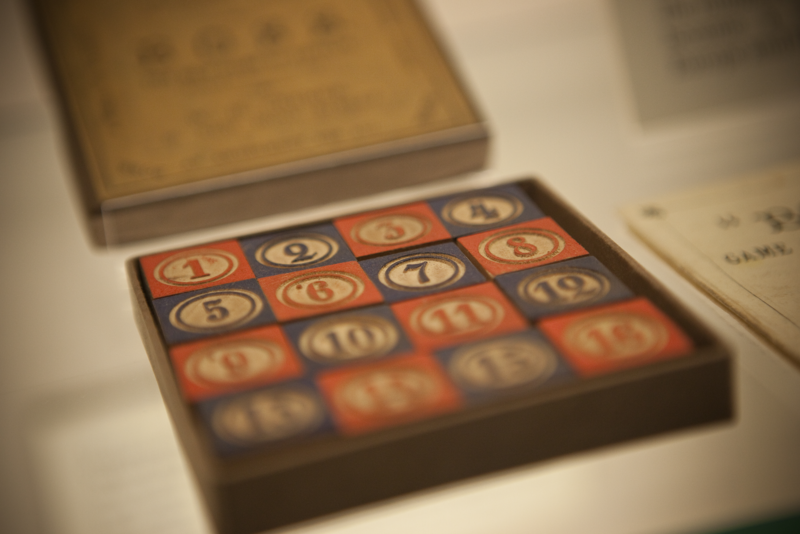 The exhibit contains examples of each of the ten mechanical puzzle categories in Slocum’s category system. As a companion to the exhibit, there are also hands-on puzzles for visitors to the Slocum Room to solve while viewing the exhibit. In this way, visitors can see the types of puzzles and they can try similar puzzles. When visiting the Slocum Room to see the permanent exhibit, or to try the hands-on puzzles, it is best to check the availability of the room. This room also functions as a classroom space, which means that it might be reserved on occasion. The library is open on Monday to Thursday from 9 a.m. to 6 p.m., Friday from 9 a.m. to 5 p.m., and Saturday 9 a.m. to 1 p.m. The Reading Room is open Monday to Thursday from 10 a.m. to 5:45 p.m., Friday from 10 a.m. to 4:45 p.m. and Saturday from 10 a.m. to 12:45 p.m. If you would like to visit the Slocum Room or see a particular puzzle, please contact Andrew Rhoda, curator of puzzles, with questions about the collection and for information about scheduling tours or group presentations. 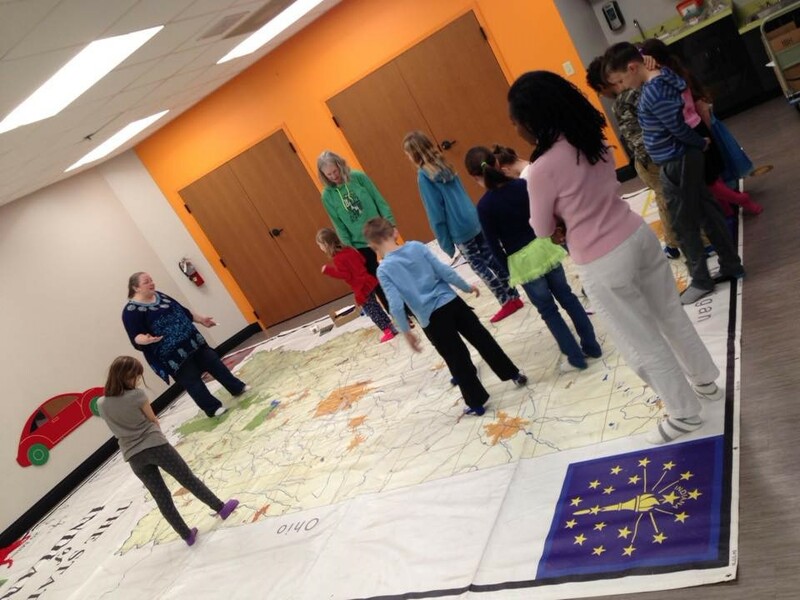 In December of last year, Kathy Kozenski from the Geography Educators’ Network of Indiana and I brought a giant 15′ x 21′ Indiana floor map1 to the Vigo County Public Library for a program called “Get On The Map!” Library patrons, ages 3 to 15, joined us in learning about state geography as we walked in socked feet across cities, lakes, rivers and forests. Photo courtesy of Lauri Chandler, Youth Services Manager at the Vigo County Public Library. We discussed the cardinal directions and talked with the students about where they had lived and traveled, and where they would like to go in the future. Despite their young ages, many had already been outside of the state and even outside of the country. We asked students to identify and locate map features. Lake Michigan, one of the map’s prominent features, was a favorite. Part of my reason for this question was to introduce the idea of the census, so we asked what else a city or town needed in order to have all of these things. This provided us with a chance to discuss how many people live in different areas, and that when there are more people we need more resources. We talked about the upcoming 2020 census, why we count people and why it is important to get an accurate count so that resources can be distributed where they are needed. We followed our map exploration with the storied adventures of Fred the Fish. Made of a small piece of muslin, Fred swam in a river – a plastic container of water – next to several different sources of pollution. We poured in small amounts of dirt, oil and trash. We demonstrated the effects of these things on Fred, and talked about how important it is to notice the effects of human population on the surrounding environment. With the 2020 Census approaching, librarians are on the forefront of community outreach, as our jobs will involve helping patrons report data to the federal government. This will be the first U.S. census in history to provide the opportunity for online response, and we expect to welcome our patrons to answer the census at our public computers. Training data users and providing access to census statistics for businesses and community members. ALA recently hosted a free webinar, “Libraries and the 2020 Census” through its Chapter Advocacy Exchange. You can view the webinar here. The ALA president, assistant director of government relations and deputy director of public policy addressed the important role libraries play in ensuring a complete and accurate count of people. It featured librarians planning 2020 census outreach in Montana, California and Illinois. In Indiana, there are several ways we can participate in planning for the 2020 census, which will take place a year from now, in March and April of 2020. Local communities are building Complete Count Committees, also known as CCCs, to encourage participation. At your library, you can help by hosting outreach efforts from the Census Bureau, promoting census jobs as they are available and incorporating census information in newsletters, social media and websites. 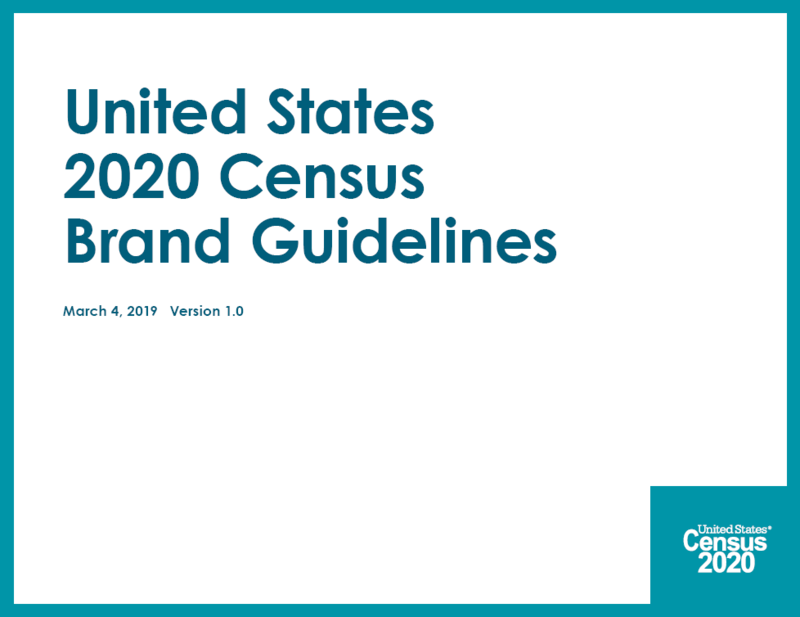 Last week, the Census Bureau released its 2020 promotional guidelines. You can retrieve the PDF here. For more information about the 2020 census in Indiana and how you can help, visit the Census in Indiana website. Follow the State Data Center on Facebook and Twitter for census messages and contact us at the Indiana State Library with questions. 1. GENI loans out giant traveling floor maps of Indiana to libraries and schools along with curriculum guides and a trunk full of learning tools. This blog post by Katie Springer, reference librarian. For more information, contact the Reference & Government Services Division at 317-232-3678 or submit an Ask-A-Librarian request. 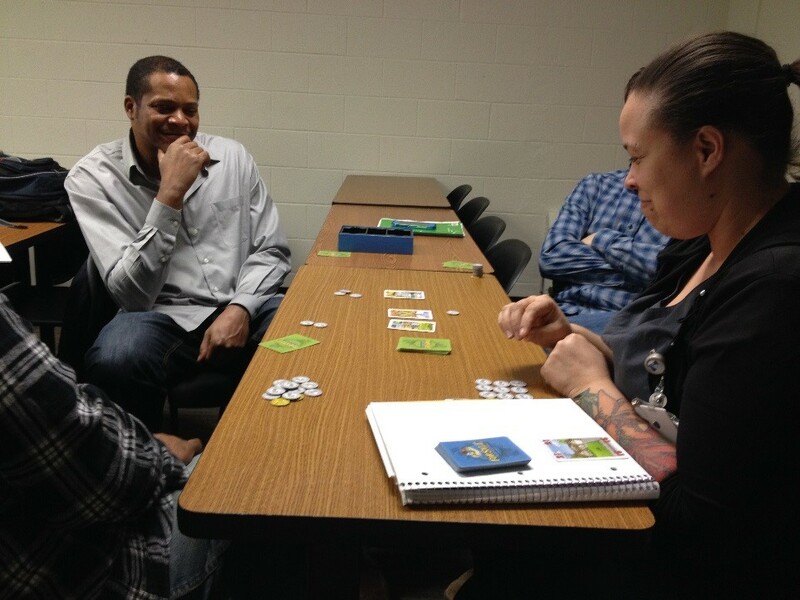 Fun and games or secret career-building tool? 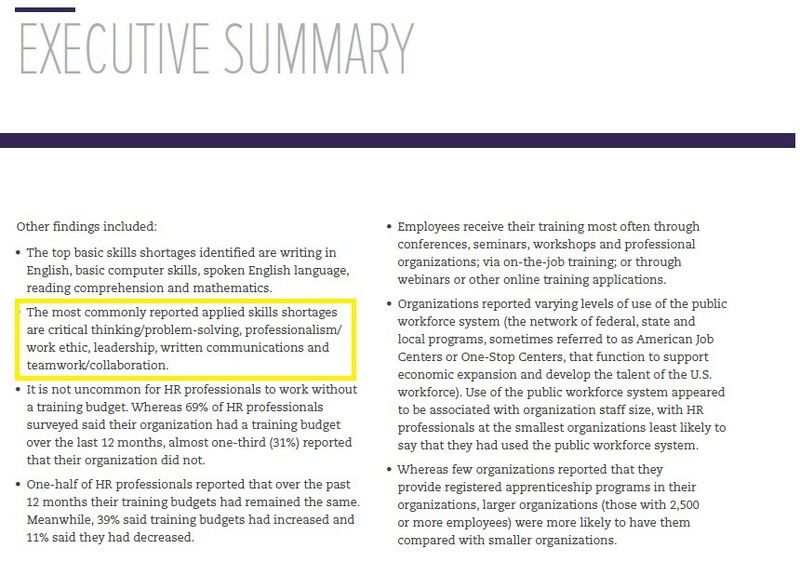 It should therefore come as little surprise that academia has been struggling for the last few years to find ways to teach these soft skills. 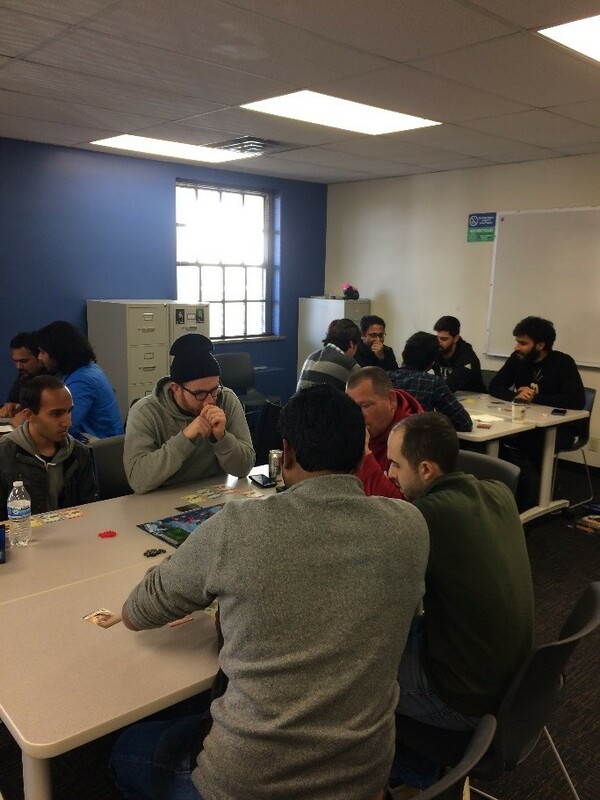 Whether it’s students in a class picking up on the concepts of conflict management while playing a collective game like Pandemic or children practicing scope and sequence by playing a game like Leo Goes to the Barber, board games can help all of our patrons with the skills that many employers are desperately seeking, thus preparing them for the future. 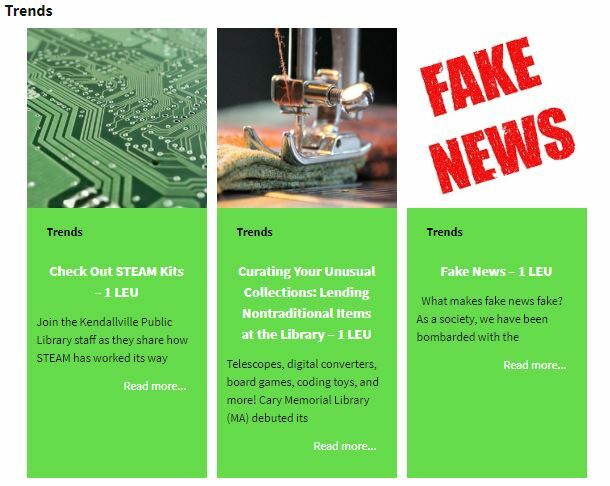 If you are an academic librarian who would like to learn more about how to implement these ideas in an instructional session or an outreach event; a public librarian who has already been using games and would like additional advice or one who is unsure of where to start; or a school librarian looking for ideas for an after school program I am here to assist you! Please feel free to send me you thoughts, ideas or questions. This post was written by George Bergstrom, Southwest regional coordinator, Professional Development Office, Indiana State Library.